The wait is over. Bif Bang Pow! is proud to introduce our First Doctor and Eleventh Doctor 8-inch scale action figures in an incredible and exclusive way! This Doctor Who 50th Anniversary Tin Tote features plenty of authentic detail and imagery that spans 50 unforgettable years of Doctor Who, from the First Doctor to the Eleventh Doctor to the iconic TARDIS and beyond! 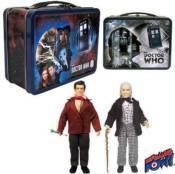 The colorful tin box (measuring approximately 8 5/8-inches wide x 6 3/4-inches tall x 4-inches deep) is magnificent enough by itself, but inside you'll find retro-style action figures of William Hartnell's First Doctor and Matt Smith's Eleventh Doctor! The Doctors stand about 8-inches tall and feature real fabric clothing, accessories, and multiple points of articulation. Carry them all with you wherever your intergalactic travels take you! Ages 14 and up.